It's that time of the week again folks; when we wait for the new episode of Doctor Who and then lovingly flail and deconstruct. This weeks episode is typical of the New!Who era. The second episode introducing a new companion often focuses on the attributes of said companion that make them exceptional. Make them chosen. Basically, it's usually a big love-in for the companion, focusing less on the Doctor and more on the human capabilities of this new woman and how brave and wonderful she is. Other trends seem to indicate that the first episode will be about The Doctor and Companion on equal footing, about their dynamic and how they formulate a relationship. The third episode is usually a display of the Doctor, his intelligence and his fury, and some ethical mishap or question that he might debate with the new companion or impose on some new beastie. So how did The Rings of Akhaten stack up when compared to other second episode companion introductions. Let's take a look under the cut. The episode focuses on both Clara Oswald's first proper trip with the Doctor and a brief look at her back story. The Doctor follows her parents and their meeting, the miracle of time that causes a leaf to fall, resulting in their meeting, marriage and in Clara. It indicates the fragility of time and of life, as well as its uniqueness, while also providing sentiment and heart for Clara in the story of how she lost her mother. Yes, this back story and sympathy is important for us understanding who Clara is as a character, but also why she is attracted to caring for children in particular. For me, the brighter part of the story is the fragile nature of time, love, fate, experience, all of those things that lead to the creation of a single unique individual, or in this case that Moffat is asking us to question that, because we've seen Clara in two other incarnations. The Doctor and Clara bustle off to see The Rings of Akhaten and participate in the ceremony of worship for the local inhabitants of their God. Akhaten contains a market place of sorts, full of weird and wonderful beings, and Clara explores by herself, helping a young girl in Mary and encouraging her to sing the song her people want her to sing. A little too late both Clara and The Doctor realise that Mary is an offering to this weeks beastie, and as the Doctor tells Clara "There's one thing you need to know about travelling with me. We never walk away". You know how it typically goes, Doctor chases little girl, moral dilemma's ensue, battle, pain, choices, heroics, rocks fall and everyone nearly dies... except that Clara offers one of the most precious things she has to the 'God', the leaf that meant that her mother and father met. This causes the deity to implode as there was too much potential in the object, too much sentiment, infinite possibility. Yes. Clara saves the day and the billions of beings saved offer her her mothers ring back as a token of their appreciation. What is interesting to me about this story isn't how it happens. Truth be told, the plot is a little sketchy at times, but what is interesting is this idea of currency in objects of deep sentimental value. This then extends to a culture that worships something that takes a soul every seven years to experience all of those wonders of love, loss and life, of which all of those objects are representative. They are what is of value. Trading those things that are most valuable for transport or for food is a very interesting concept. Depth aside, did this story hold up compared to other companion second episodes in the New!Who universe? Rose had The End of the World, Martha tumbled with Shakespeare and Donna with Pompeii. Amy's episode was The Beast Below. All of these stories dealt with moral and ethical dilemma's, with helping the Doctor with humanity, with saving the day. All of these are also mildly clunky episodes. They are perhaps bland in some respects. They are often very self contained and don't feature a lot of travelling. Might be the reason the TARDIS wasn't used (she doesn't like Clara!) and why the Sonic Screwdriver is used SO MUCH (annoyingly). Similarities? Well, Rose was introduced to a number of different alien creatures at once in her episode, and at a momentous event. The episodes all feature the companion doing some exploring on her own. They are also all very emotional episodes that are seeped in the history of that particular culture. Some heading into the future and some into the past. All of the companions face a very emotional situation and have to come out on top. Donna has to struggle with the choice of saving people in a fixed point in time, in the same way, Clara and the Doctor interrupt a ritual that has the potential to result in a lot of death. Perhaps most comparable though is Amy's second episode, one full of ethical debate and also resulting in a choice that can lead to a lot of death. The Beast Below was very good, mostly due to it's depth, it's look at what people would do to survive and the unethical things that we might try to disguise to make ourselves feel better. Clara's episode is the same, but the tact is that the unethical behaviour is ritualised and the little girl prepared for seven years, offerings of precious objects made, songs sung, glory and love. It's interesting. The Beast Below's story is much stronger, but Clara as a companion performs a lot better in her episode than Amy does in hers. Clara displays both compassion and strength of character, where Amy chooses to forget. This doesn't yet make Amy a less companion, but it bunks the common display of the companion as exceptional. She did what everyone else did and then redeemed herself. Clara did what no body else would. In this way she seems more like Donna in The Fires of Pompeii, trying to wrestle with the death and destruction and trying to step up and do something different. Saving lives. 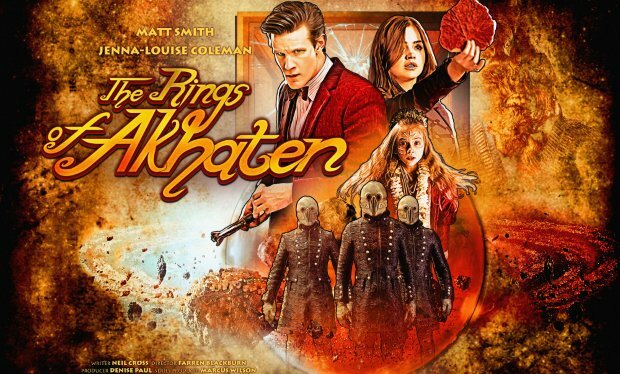 All being said, I would suggest that The Rings of Akhaten actually holds up quite well in comparison to these other episodes. It's up there with Pompeii and The Beast Below. All, however, are not the finest episodes in their respective seasons. Next week looks to be another self contained episode on a submarine. It features the most recent guest star doing the sci-fi/fantasy rounds: Liam Cunningham (recently on both Game of Thrones and Merlin). No doubt, in third episode of a new companion phase, the Doctor will be very shouty and heavy handed.